Have you ever wanted to be a day trader? Have you ever wanted to make a bet on a hot stock tip you heard over the water cooler? You should. You should have a little fun. Investing should be fun. Otherwise, why are we sticking with it? There is only so much excitement you can find with the old buy and hold strategy. But, don’t get me wrong, every investor should have a small slush fund to have fun with. If you currently have $100,000 in retirement accounts and routinely maximize your Roth IRA and 401k retirement accounts every year, you may want to consider taking $1,000 aside and investing it in a hot stock tip or the latest exciting company. What is wrong with using 1% of your equity investments to get you excited, to follow your passions, to play your hunches? I love trying to pick stocks that I think will appreciate over time. Sometimes I am successful, and more often than not, I end up selling my small block of shares for a loss. But, nevertheless, I love trying my hardest to pick these stocks, and I only do so with a very small portion of my overall investment portfolio. I should start my own mutual fund. Or, at least I think that I should in my own mind. I am a great stock picker. I’m a great stock picker, but I am not about to bet my retirement, my children’s college education, or my family’s security on it. I will leave that to the professionals who have more time, education, and experience in these matters to handle that portion of my investments. I believe that everyone has a competitive advantage in life and their careers, and mine is not picking stocks to purchase. I still have a small discount broker account though and love to trade stocks in it. But, it is a very small account. It helps me keep from thinking that I can quit my day job and become a day trader full time. Using a very small portion of your equity investments fulfills that desire to make a killing on a tip from a friend or stock broker. Using a small slush fund and investing it any way that you choose helps investors stay disciplined when it comes to their core investment philosophy. 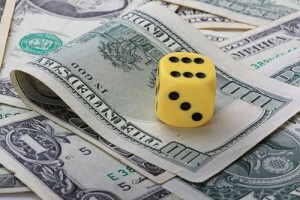 Gambling with $1,000 will keep you from gambling in your 401k retirement plan or in the mutual funds in your Roth IRAs. You have a plan or you paid a financial planner to help you develop a plan, and only using a small discount brokerage account to invest in individual stocks can help keep you on that plan. I know that this idea sounds a little unconventional, but everyone should have a little fun. It keeps you excited about investing and engaged. Great investing is boring. It is the tried and true method of buying low, selling high and buy and hold. Investing is not gambling. True investing is sticking to your investing plan and investing philosophy. But, using just a very small portion can help you enjoy investing and stick to your overall plan in the long run. It is your money. You earned it. Like with a pay raise, you should enjoy a small portion of it.